Ghollywood actress, Juliet Abrahim is one actress who is so secretive about her private life when it comes to his son, Jayden. Jayden is a product of her ex husband, Kwadwo. 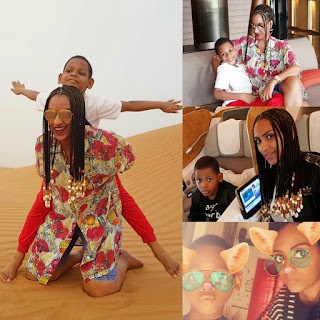 The beautiful actress who was previously rumoured to be in a sizzling romance with rapper Iceberg Slim took to her social media page today being his 7th birthday, she decided to show him off to the world how big and proud his little boy, Jaden has become. Happiest birthday to my dearest love Jayden, mummy's big man. I love you so much son.